Attracting, hiring and retaining the best hospitality talent is more of an art. It is this very art that we aim to elaborate on in this post. The hospitality industry has suffered from a horrendous staff turnover rate leading to millions in losses to the industry. Plus, this also brings down the morale of the team and leads to a drop in productivity. Staff turnover is actually one of the major management issues in the hospitality industry. The staff turnover rate for the hospitality industry, based on multiple research, is double the average across industries. Thus hiring the best talent is crucial, but even more important is retaining them in the longer run. Employees should be treated as long-term investments. More in the duration, higher would be the profit. So, let’s get into discussing this art while we suggest various action steps to hire and retain the best hospitality industry professionals. We have divided this post into 3 sections. The first one discusses ways to attract the best job applicants from the hospitality industry while the second section covers the hiring process. The third and final section discusses the key action steps required for retaining the best hospitality talent. Let’s get started with the first point. As a hospitality recruiter, it is crucial to get more qualified hospitality candidates apt for the respective roles. The Hospitality industry is quite stacked with a lot of overlap. Tight salaries for lower and middle job roles make matter worse in terms of attracting the best hotel industry professionals. So, it is extremely important for any hospitality business to ensure that the creme de la creme of the hospitality industry apply to the job positions. Here we have outlined a few strategies that might help the cause of attracting the best hospitality talent. The post by Atrivity explains more on crucial steps towards effective company branding for attracting the best hospitality talent. When every other hotel business out there is fighting for the right hospitality talent, it is crucial to place your brand in a way that helps the cause automatically. Techfunnel through the below image suggests that it’s not only the hiring but the overall success that is impacted by the company branding. The guest experience is changing. The old school methods don’t work anymore. The expectations have changed with millennials ready with the backpack looking for a better experience and a more interactive environment. It is thus important to target the millennials to apply for hospitality jobs. It is these people who are built for technology. Also, as per conducted research, it is expected that 75% of the workforce would be constituted of the millennials by 2025. Targeting the millennials is for sure an investment for a better future. The below chart by Deloitte gives the key stats on the changing guest experience. The expectations are charing continuously and millennials of today are driven by change. It is important to be visible on multiple platforms and formats in order to attract the best hospitality professionals to apply for jobs. There are a lot of Hospitality Job Portals around the globe and posting jobs here helps in better visibility within the hospitality niche. Social media is overcrowded these days and thus it gets difficult to be visible properly. Opting to invest time and money effectively on professional networking channels like LinkedIn can help in getting quality applications. 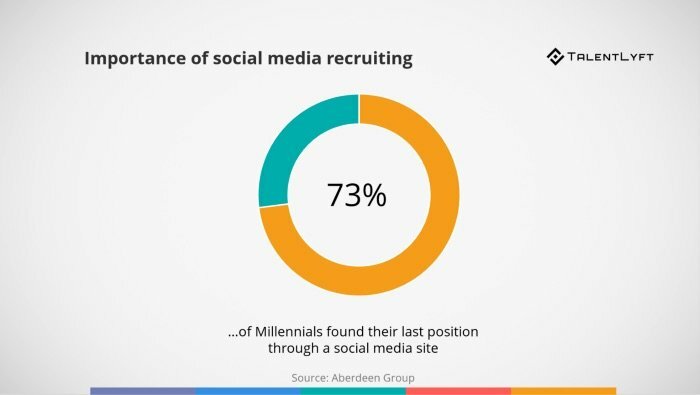 Most of the people especially the millennials look at social media for getting hired. It is always good to have the right mix by using certain portals and focusing on 1-2 social media channels. Turn to innovative ways to attract the best talent from the hospitality industry. Sharing videos and images which speaks a volume are a key to create a connection with potential job seekers. Not only does it help potential hospitality job seekers in knowing the brand, but it also creates anticipation of the culture in the minds of the job aspirants. Now moving on to the next and probably the most important stage. Now that your hospitality business has a great reputation and amazing hospitality professionals, all professionals from the hospitality industry would be pushing to join the firm. So, its extremely important to have a well rounded and fair recruitment process. Listed below are a few tips to help hospitality businesses hire the best hospitality talent. There are a lot of automation tools out there to help hospitality recruiters automate a few of the hiring steps. 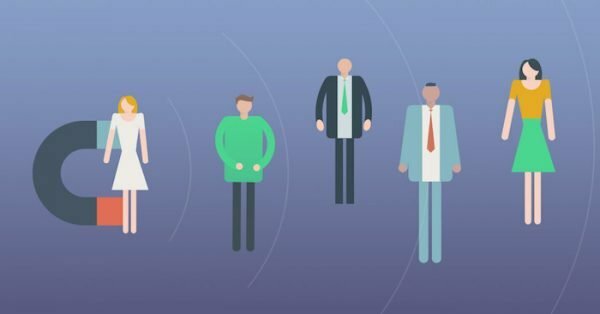 From CV screening bots to automated interviews and skill tests. And, there are a lot more automated tools to help out the recruiters in the tedious process. This Global Hospitality Portal has an innovative hospitality filter question which can automatically weed out unrelated applications. While few of these steps are useful to remove spam and unrelated applications, too much reliance on automation might weed out better applicants who are not adept in technology. Too much of automation can be risky in hospitality recruitment. The Hospitality industry is still people oriented and thus bots can’t reject humans based on random CVs. Artificial intelligence aims to provide a better understanding of human nature in the future but the travel industry could possibly be one of the last few industries to embrace it completely. So, as of now sticking to the old school auto mailers, skill tests and basic machine learning filters could be more than handy. Normally the job recruitment process in the hospitality industry would fall somewhere between 30-90 days. It is important to stay connected with the candidates during this process. Effective feedback and quick recruiting cycle are key needs of the Hospitality Jobseekers of today. Artificial intelligence can be of some support. As discussed in the previous point, ideally a good mix of human and technology can do wonders to the efficiency of the hospitality recruitment process. 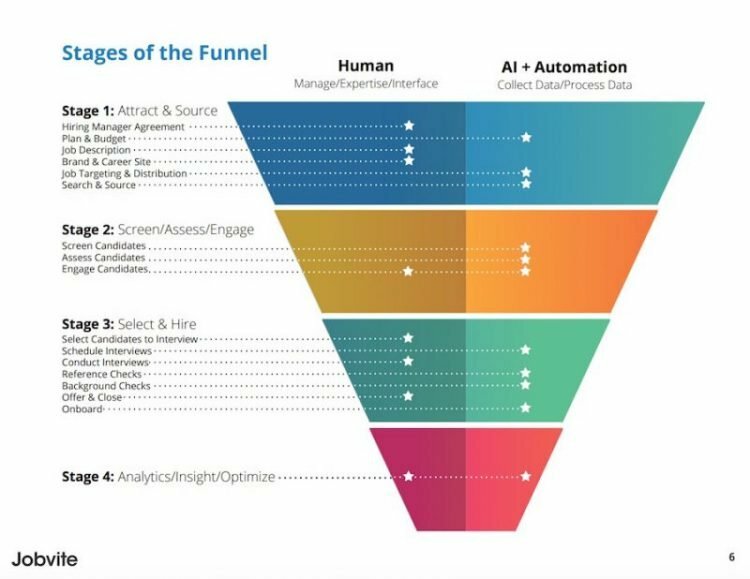 The below image by Jobvite elaborates on how an efficient recruitment process can have a good mix of AI and human intelligence. The Subtle Art of Recruiting the best hospitality job applicants include understanding the pain points of the industry. The art of hospitality recruitment would also include understanding the key gaps between the expectations of recruiters and that of job seekers. The below image by Intraworlds shows key gaps between expectations of job seekers and recruiters. The art of hospitality recruitment is about being compassionate to job applicants and treating them as internal customers. The interview process in the hospitality industry can include anything between 1-7 rounds. It is always good to respect the time of job applicants. Candidates should be supplied with the agenda, duty description and other information well before the interview. And most importantly, it is important to keep it simple. Simplifying the whole process would do wonders for the whole hospitality talent search. Now moving on to the retainment of the best hospitality professionals after the hire. The relationship with the hospitality job applicant starts with the first interaction. That is even before the interview. However, it is the orientation that plays a key role in establishing the relationship between the employee and the organisation. When the relationship starts on a strong and sweet note, it’s set to last longer. Wouldn’t you agree? Yes, this is so crucial that it demands a separate heading. This is a key step in the art of retaining the best hospitality talent. It is of paramount importance to ensure that employees are given ample opportunities to learn and upgrade their skills. Some of the largest hospitality chains like Hilton provide free opportunities to take up further education or get career enhancing hospitality industry certifications. Employees appreciate organisations that enhance skill building. Did we forget to mention that investing in training can have an immediate impact on employee productivity and the organisation’s profitability? The Hospitality industry is probably the most diverse industry. 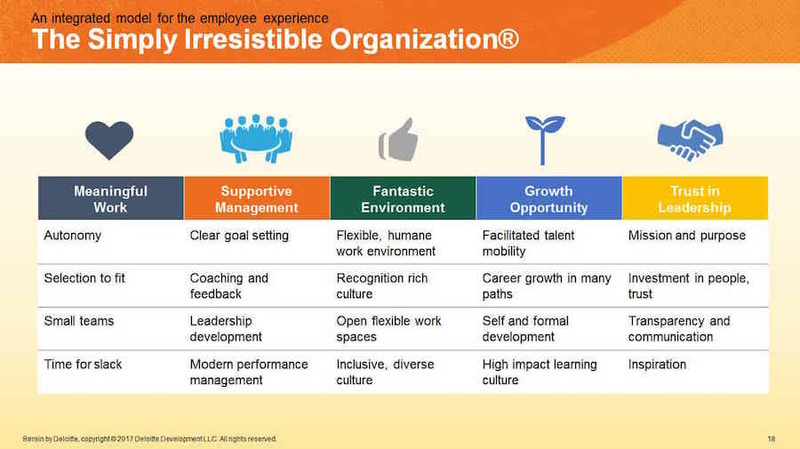 According to HRMonline, managing culture holds the key to better retention of employees. This is even more important for retaining hospitality employees as even small teams in this industry has people of multiple nationalities. The hospitality industry is one of the few industries which can boast of a balanced men-women ratio. The hospitality industry can be extremely demanding in terms of work hours and shift times. Working on holidays is another issue that lots of hospitality professionals complain about. One of our earliest posts covers this issue in a very positive manner by presenting funny images about the hospitality industry. Even the long and daunting work hours in the hotel industry give minimum leverage for the display of creativity. A lot of Top hospitality companies have started to push for creativity workshops and team building exercises. Efforts are being made to make all hospitality organisations safer and happier. A sense of purpose even helps hospitality employees to stay longer with the organisation. A meaningful work environment as displayed in the image below can do wonders in attracting the best hospitality talent and then retaining them for a longer duration. Addressing the Employee Turnover issue through compassionate leadership is the key to reducing turnover. Retaining the best hospitality talent requires more than the traditional set of human resource practices. Hospitality industry is all about service. When most of the other industries are forcing automation to most of their work processes, the hospitality industry still needs more human. Thus, it gets even more important to be compassionate to the workforce. Skill development, purpose and workplace environment would hold the key to retention of best hospitality talent in the future. Now, that most of us know the science behind the importance of attracting, hiring and retaining best hospitality talent, it’s time the hoteliers consider this as an art that’s worth working upon.